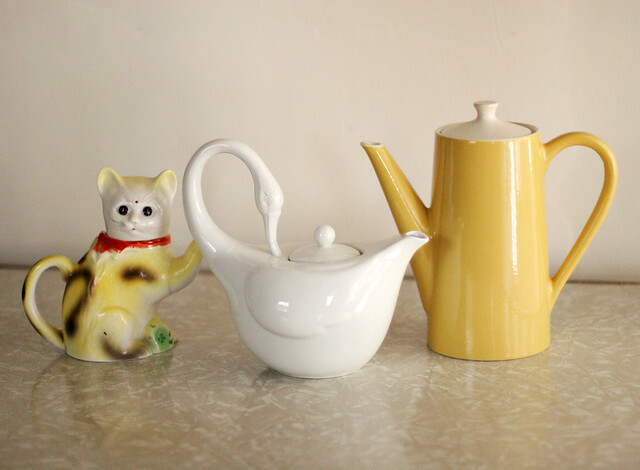 The swan teapot is from ModCloth, the kitty teapot was my great grandmother's, and the yellow teapot was a hand-me-down. I'm pretty excited to see where this collection (slowly) goes. I just need to fight the urge to go out and buy every cute teapot I see. I have an obsession with lamps, chairs and pitchers. I really like the swan teapot. These are adorable. I am not a collector of any certain thing but I sure know what you mean about being a "pack rat." because that is totally me. Can't wait to see what other tea pots you will find. I have an unintentional collection of teapots too. I can't wait to have my own place and a darling china cabinet to display them all! My advice to you is avoid Home Goods! I could go crazy in there with all their cute teapots and tea cups. I found the cutest camel teapot at the thrift store a few months back. I thought about getting it, but I didn't, and then I found out about a cousin who collects teapots. I happened to go back a week later and it was still there! I ended up shipping it off to said cousin. I love the mustard coloured one. Beautiful! Teapots are great items to collect. You can enjoy them everyday again. What's more comforting than a hot cup of tea? I'm a teapot collector too - that swan teapot is gorgeous! Oh my goodness that kitty tea pot! Fantastic. well now I will have to keep you in mind if I see any fantastic teapots! I've always been a pack rat too! At 26, I'm learning to do the same! Lovely teapots!!! Adorable, I love the swan teacup. When I have my own house/space I've always wanted to start a collection of teacups. Oh my goodness I am such a pack rat/ boarder line hoarder it seems. I am still in college living in a dorm room though. Perhaps I am just overwhelmed because of how little space I have. I am working so hard to pare down to just the things that have actual meaning. I definitely have a collection of tea pots coming on too! I am a ceramicist and tea pots are my favorite things to make! Awesome teapot collection! I'm also a pack-rat collector, my Mum used to call me Sam Pig from a book about a pig (called Sam) who collected everything in his trousers (pants) pockets! I actually need a teapot! love the yellow one! ...you know, you could go out and buy all the cute ones and then sell them on etsy! My mom collects teapots too: she has been collecting for the last 13 years or so. She literally had to ask people to stop gifting her teapots because she had no space for them, haha! I'm a bit of a collector too with books and "kissing" salt and pepper shakers. I love the cat, its so cute! The swan teapot is my favorite! I hope you find a good place for your collection! Teapots sound like a fun thing to collect because there are probably a lot of unique possibilities out there. I am in love with that swan teapot. Ah these are great! What a wonderful thing to collect! That swan teapot it BEAUTIFUL. (It looks like everyone agrees on that one!) I've found myself fawning over figurines at all my favorite antique stores - at least teapots can be put to good use! What a darling collection you have going! It's so important to have something to collect. PS: Stop by my blog if you like thrifting, vintage dresses, flower crowns, Moonrise Kingdom, DIYs, and adventures! I just did a post on my latest nautical sailor dress! The swan teapot is so cute. I love the first picture of it. The little piece of fabric is so cute underneath it. Nothing wrong with collections! They make a verson unique because everyone collects something different! Such cute teapots. The swan one is definitely my favourite. I also tend to collect things (sometimes unnecessarily but oh well). Teapots are quite unique things to collect. I don't drink tea very often, though it's something I want to get into. However, after receiving the most beautiful Japanese clay tea set from Jen as a birthday gift years ago, I've wanted to start collecting teapots and sets. They are just so charming and there are SO many unique teapots. <3 I love your collection! How pretty!! Teapots are a beautiful thing to collect! I guess I shouldn't tell you that Crate & Barrel are doing an anniversary teapot a month! Here's the link if your interested! These teapots are so cute! :) I´m also a keeper but I´m not really organized at it! 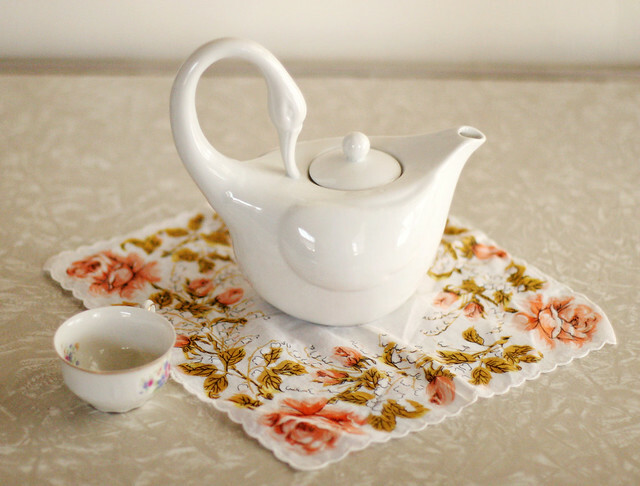 The swan teapot is so cute! I have an obsession with silver, gold and rare coins. I am selling gold coins if needed. 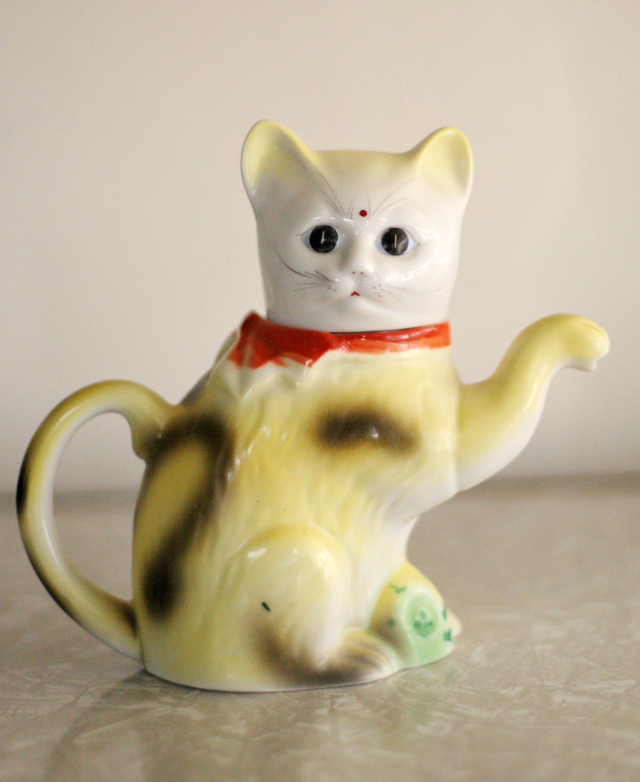 I sooo want to find a kitty teapot, so cute! That cat teapot is so cute but I can imagine the swan teapot being a really great one for an elegant afternoon tea party with friends!